Filipino food is having its moment. Sour, sweet, funky, fatty, bright, rich, tangy, and bold - no wonder adventurous eaters like Anthony Bourdain consider Filipino food “the next big thing.” But so do more mainstream food lovers - Vogue declares it “the next great American cuisine.” Filipinos are the second-largest Asian population in America, and finally, after embracing Chinese, Japanese, Thai, and Vietnamese food, we’re ready to eat like a Filipino. And ready to cook like one, too. 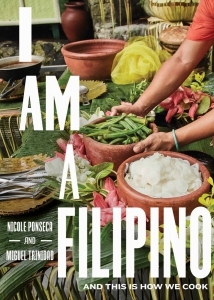 Written by trailblasing restaurateurs Nicole Ponseca and Miguel Trinidad, I Am a Filipino is a cookbook of modern Filipino recipes that captures the unexpected and addictive flavours of this vibrant and diverse cuisine. The techniques (including braising, boiling, and grilling) are simple, the ingredients are readily available, and the results are extraordinary. There are puckeringly sour adobos with meat so tender you can cut it with a spoon, along with other national dishes like kare-kare (oxtail stew) and kinilaw (fresh seafood dressed in coconut milk and ginger). There are Chinese-influenced pansit (noodle dishes) and lumpia (spring rolls); Arab-inflected Muslim cuisine, with its layered spicy curries; and dishes that reflect the tastes and ingredients of the Spaniards, Mexicans, and Americans who came to the Philippines and stayed. Included are beloved fried street snacks like ukoy (fritters), and an array of sweets and treats called meryenda. Filled with suitably bold and bright photographs, I Am a Filipino is like a classic kamayan dinner - one long, festive table piled high with food. Just dig in! Get ready to discover the next great Asian cuisine.